"Hi Jen, a very good friend of mine has been going through a period of darkness and PTSD with horrible flashbacks of being deployed. He's a police officer and retired US Marine Captain. He's also a body builder prepping for an upcoming competition. I love your bracelets so much and I would like you to design a custom bracelet for him." 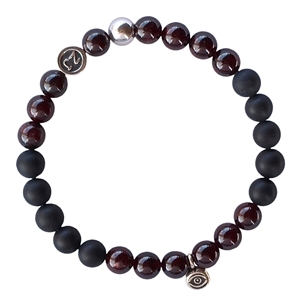 Gemstones used in this design: Matte finish Onyx blended with deep red Garnet with an evil eye centerpiece for Protection. "Thank you so much for the absolutely gorgeous bracelet. It was very much loved. Your bracelet gave me chills and brought me tears to my eyes."